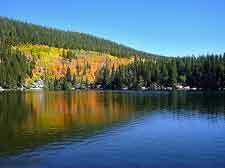 A hugely popular location for short breaks in summer, the relatively small population of Estes Park can soar at the weekends, when crowds flock here to explore the adjacent Rocky Mountain National Park and extremely beautiful scenery. Estes Park caters well to the tourism influx, with plenty of affordable motels and shops selling a range of outdoor gear. Tourism has been an increasingly important part of life in Estes Park for more than 150 years, attracting everyone from backpackers to bus-loads of sightseers. 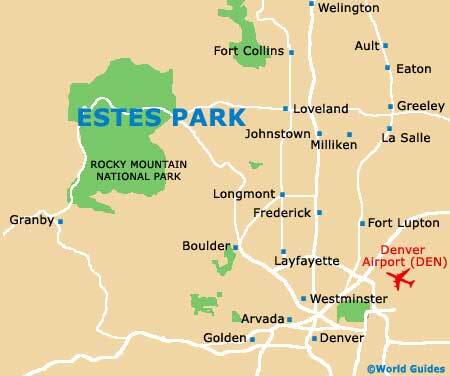 The name 'Park' simply refers to the town's valley setting, while 'Estes' is actually the surname of an early settler. Today, tourists are strong advised to visit the Estes Park Visitors Center on Big Thompson Avenue, close to the Highway US-36 junction, where staff will help with any necessary tourist information and lodging requirements. 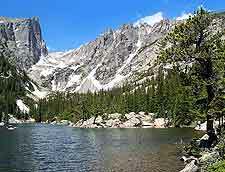 Many of the main sights around Estes Park reside within the Rocky Mountain National Park, being reached by literally mile upon mile of hiking trails. Guided hikes are available, while for those looking for a less energetic way to enjoy the scenery, the views don't come much better than when you take a ride to the very top of the Prospect Mountain, onboard the Estes Park Aerial Tramway. Wine tasting sessions are popular and available close by, at a number of neighboring wineries, while for families, a day out at the Fun City on Prospect Village Drive is hard to beat, as is its backdrop of the Rockies. More information about Estes Park Tourist Attractions. There are some exceptional landmarks dotting the skyline around Estes Park, with natural wonders such as the Longs Peak, the region's highest mountain and part of the Rocky Mountain National Park. The Old Man Mountain is another sight for tourists to behold and the trails to its summit are not to be missed. Dating back to 1909, the Stanley Hotel is one of the town's most important and historical buildings, being mentioned on the National Register. 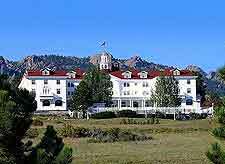 Anyone lucky enough to be able to afford a room in this sumptuous palace will enjoy unbeatable luxury, glorious elevated views across the Estes Valley, and even the chance to join a spooky ghost tour of the supposedly haunted rooms and underground tunnels beneath the Stanley Hotel. 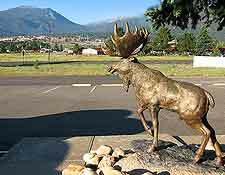 More information about Estes Park Landmarks and Monuments. If you are enjoying your time so much that you feel that you would like to find out some information about the town's history, then pay a visit to the Estes Park Historical Museum. Alternatively, the Stanley Museum is truly fascinating, documenting how the appearance of the town was altered so much in the early part of the 20th century, after the arrival of forward-thinking business tycoon Freelan Oscar Stanley. If art is more your thing, then Estes Park will provide on that front as well, with scores of art galleries lining streets such as Elkhorn Avenue, Riverside Drive and Virginia Drive. More information about Estes Park Museums and Estes Park Art Galleries. Although the sights and sounds within the Rocky Mountain National Park are hard to better, Estes Park does lend itself to a number of engaging day trips. The popular Colorado cities of Arvada, Aurora and Boulder are all just a relatively short drive from Estes Park. Tourists will find that it is even possible to take a short excursion to the exciting metropolis of Denver and its many skyscrapers, and slightly further afield, to Colorado Springs, where the awesome sandstone rock formations at the Garden of the Gods are a much photographed sight. 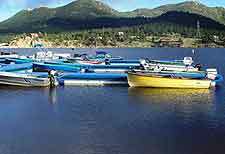 More information about Estes Park Attractions Nearby.